A chronicle of one organization’s determination to bring hope and healing to Syrian refugees through innovative education. In April 2015 the Karam Foundation, a Chicago-based nonprofit organization, launched its fifth Innovative Education mission for displaced Syrian children and youth. Karam’s team of more than 40 international mentors worked with upward of 400 Syrian students from four schools in grades 1–12, leading workshops that included entrepreneurship, arts, language arts, sports, yoga and full dental/vision clinics and screenings. This series of posts about our mission, in the words of the mentors, offers a glimpse of what it is like to work on the Syrian border, shares personal stories of extraordinarily talented and resilient kids and reminds us that the Syrian children are more than the world knows, more than the world lets them be. They are #NotInvisible. The Syrian conflict has created the worst humanitarian crisis of our lifetime. Yet in the midst of despair and destruction there is hope for a brighter future. This series is dedicated to our unwavering hope in the next generation of Syrian kids. We hope the stories will inspire you to action. The hills around Reyhanli, where Turkey slopes gently into Syria, are colored with the crimson red of shaqa’iq an-Nu’man. This wildflower, known as the poppy anemone, grows all over the Mediterranean region. According to local mythology, these flowers bloom wherever unnecessary blood has been spilled. 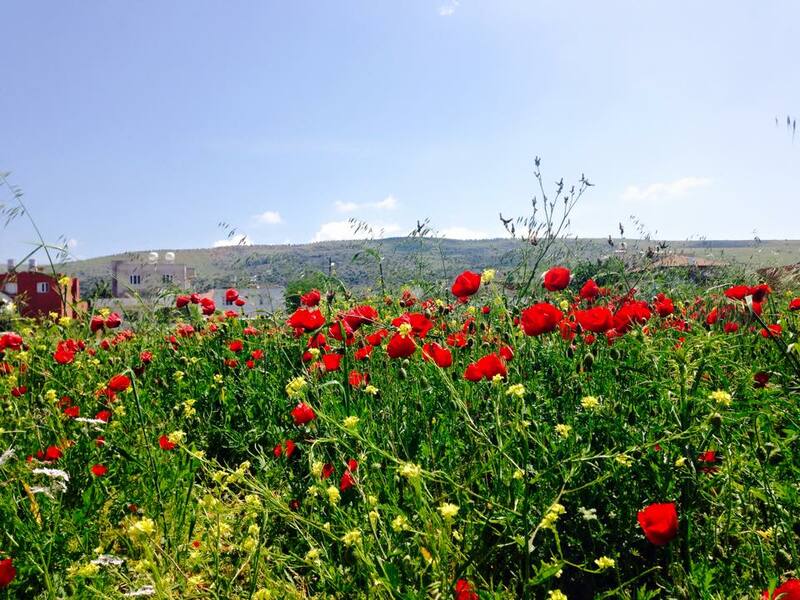 In and around Reyhanli, the stunning red flowers dot the landscape, growing wherever they can. The journey to Reyhanli was amazing. Watching the sprawling urban metropolis that is Istanbul slowly fade into the Turkish countryside and into the familiar landscape of Hatay sent shivers down my spine. On the bus on the way to the hotel, I was seated next to a Syrian-American doctor, originally from Homs and now living and working in the Washington metropolitan area. “This is what Homs looked like. Full of shaqa’iq. Just as green,” he told me, pointing out the window. “This is the second time I’ve come here. The last time it was winter and you couldn’t really see much. This time, though…” I looked, and I could see Syria in a split second. A vision of what it was once was, of what it could be. It is in this setting that one finds al-Jeel, a Syrian school in Reyhanli: surrounded by the shaqa’iq, with the hills of Syria and Turkish guards patrolling the border in the background. 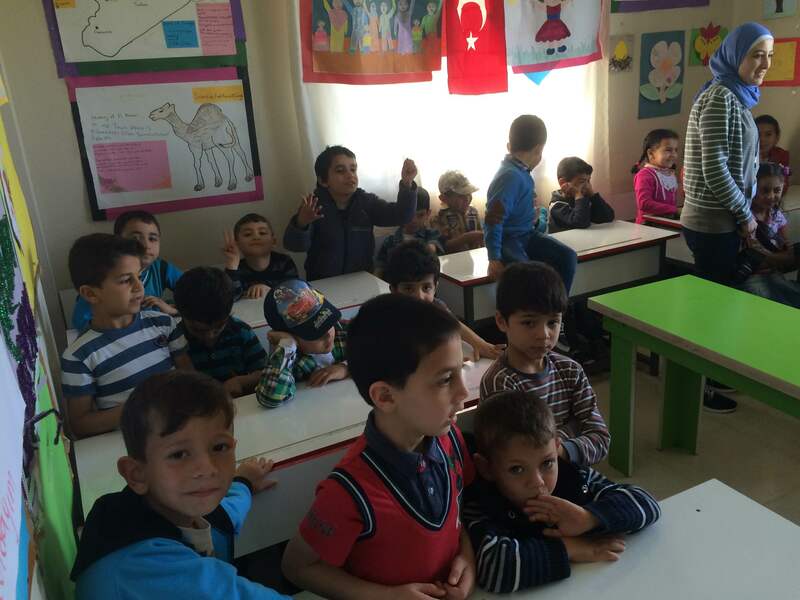 Al-Jeel is a small yet beautiful school staffed by Syrians who have been displaced in the ongoing conflict. Amidst bucolic scenery, one can hear the laughter and screams of children playing in the playground of al-Jeel. One cannot see the beauty of the shaqa’iq flowering and blowing gently in the wind without thinking of the beauty of these children. Al-Jeel was host to Karam Foundation’s fourth Zeitouna mission, a creative therapy and physical wellness program designed to inspire and heal the youngest victims of the Syrian humanitarian crisis: the children. More than 40 international mentors were there to lead a week of various art, sports and wellness workshops. I was lucky to be one of them, a storytelling mentor, working with children from grades 1 through 6. As our bus made its way each day back and forth between the school and the hotel, most of us would look out the window, trying to take in all the sights: buses transporting Syrian laborers to and from the agricultural fields; Syrians lined up in front of the local police station, trying to register as Turkey’s “guests”; street vendors selling fruits and pistachios; and many other scenes of everyday life. I would open Google Maps and see how close we were to Syria. How close we were to villages and towns that I am now only familiar with due to the tragedies that have unfolded there over the last four years. Occasionally, we would pass by a traffic sign with the name of a Syrian city highlighted in bright yellow. Aleppo. Lattakia. Idlib. All flashing before us, taunting us with their proximity. The children at al-Jeel school greeted us with open hearts and arms. All were so eager to spend time with the volunteers, and these feelings of excitement and happiness only seemed to grow each day we were there. It was a blessing to host storytelling workshops for them: with the use of prompts, Rory’s Story Cubes and their imaginations, the children came up with fantastical tales about talking animals, treasures and journeys. They clambered over each other, excited to share their stories, often acting them out with their classmates and friends. Seeing their happy faces and hearing their eager voices telling tales was the greatest blessing. Getting to know these children from all over Syria was exhilarating. Much like the flowers in the fields surrounding the school, the children have been blooming despite the bloodshed that forced their displacement. They are blooming – and they are beautiful. Unfortunately, the shaqa’iq are ethereal flowers, generally blooming once a year for a few weeks at most. The children resemble the flower in this way, too; their futures seem fleeting and even bleak without attention and focus from those of us whose privilege it is to help. Supporting the development and wellness of young refugee children is what will ensure these young flowers do not die out – and that they can continue to bloom into a brighter future for Syria. Lilah Khoja is a Syrian-American writer and researcher.